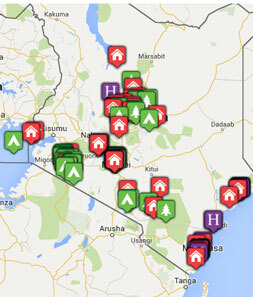 Tribes Overall: "but for the driving distances, and over some washboard roads, entire itinerary was excellent, with focus on the Sheldrick ele orphans, at Nairobi Nursery and at 2 release units at Voi and Ithumba..."
Tribes Service: "glitch with extra day at end which we'd not requested-but other than that, good." Guides: "He was tops - not just on wildlife knowledge, and ability to find the most elusive ones, like leopards and cheetah, but also on geography/topography and politics." "Guide obviously very well-known/respected, as rangers gave him/us special permission [and we were only group allowed] to get close to cheetah mama and 5 cubs for observation and photos...was extraordinary... saw 3 new-borns, guide said they born either just minutes or a few hours prior to our arrival on the scene: a topi, a tommi and an elephant-incredible."